Rob's Idaho Perspective: As slow as possible, as fast as necessary! Welcome to the second update for this year's field season studying the Northern Goshawk for my Master's thesis in Raptor Biology. My field assistants and I have just returned from nine days in the field with a new collection of adventures! The season continues to be a huge success, but there are some indications of a possible dark cloud on the horizon. This bout of effort included the launch of new procedures for the season. We have started our prey surveys. Each team member conducts two prey surveys per day in two separate goshawk territories. The prey surveys consist of walking 750 meter transects and noting the distance to each potential prey item. Each survey requires a little over an hour to complete when you factor in transit time back from the survey. In total, we completed 41 surveys during this bout falling a bit short of our stretch goal of 50. The snow that I will describe later had a little bit of influence on that! Regardless, we do have time in the schedule to make it up. The second new method launched May 31st, is the use of call broadcast surveys. In territories where we have not yet discovered an occupied nest, we play a recording of a goshawk alarm call to solicit a response by resident birds. The team and I have complete 121 call points! This has led to the discovery of three more occupied nests for a total of ten which matches last year's count. We have had a response in an eleventh territory, but have not yet found the nest. At this point last year I had only identified 5 nests. Nestlings! While we have yet to get visual confirmation of hatched nestlings, we believe that nestlings have hatched in at least four of the ten occupied nests. Clear signs include the female sitting a little higher in the nest than when incubating and her being more fidgety than while incubating. If true we should get clear signs early next week. The team. The team is really coming together. I think we have all learned a great deal about each other and respect the unique contributions that each person makes. Mike, the map guy, studies the territory maps and plans out each route meticulously. He seems to have memorized every road sign and turn in the hills. He is so focused on navigation that while sleep walking one night at 2am, he went to get his GPS; apparently fearing he would get lost in dreamland! Mike has thoroughly studied birding by ear using Larkwire, and has quickly surpassed my own abilities. Emmy could not be more unlike Mike and I. Her outgoing nature puts the two of us introverts to shame and definitely keeps us on our toes. Nothing seems to get her down. She is a great spotter having just stumbled across an occupied goshawk nest while walking in the woods. On organized searches, she is often the one to find the nest. We give her a hard time as most of our equipment issues have had some connections to her! Regardless, she jumps right in on any task and gets the job done. It really is a great team! During this bout, we also hosted a few volunteers. Volunteers are great as they help with the large workload we have to do and usually even fix us dinner! How cool is that! Karyn showed up for a few days and helped me on prey surveys and on nest searches. Michelle J. came for a few days to march through the woods on her own in search of new territories. 11 call points, a new goshawk sighting, and some great venison pasta for dinner... awesome! Lastly, Greg and Dusty came down to try to find some old nesting structures that Greg had visited years ago. The weather didn't cooperate, but they still fixed bar-b-que elk steak and dutch oven potatoes. In the end, they did get out on questionable roads to find the nest structures we were hoping for. And we were all fat and happy! Luck was on my side. Sometimes it just takes a second set of eyes. Mike was on a roll with the call broadcasts. One day he received a "vocal response" to a call broadcast. This almost always means that there is a nest nearby. He began searching for the nest, but was not able to find it. The bird rarely responds a second time during one day. After giving up for the day, I returned the next day to take over the search. I played a call with no response, then just happened to walk right under the nest! Sometimes, this is how it goes. Meanwhile, Mike had another response in another territory. Once again, he did not find the nest. It is much, much harder than you think! Michelle and I took over and out of sheer luck, I found the nest within five minutes. I truly walked into the area, sat my pack down, and looked up to see the nest. Unbelievable. I was on fire! But, all good things must come to an end... It was Emmy's turn to get a response and I confidently jumped at the opportunity to once again show them how it's done. Unfortunately, it didn't work out that way. Karyn and I searched for hours without a nest... Don't worry, it's there and we will find it. Equipment woes. My female field assistants have a history of naming their ATVs. Last year, the blue ATV from the forest service was affectionately named "Old Yeller" by Lauren. This year Emmy renamed it Earth, Wind, and Fire. Late last week it became Earth, Wind, and no-Fire... (Karyn came up with this one). We, and Emmy specifically, were lucky that it chose to loose its fire while at the base. A 20 mile walk from the far reaches of the South Hills is not something that I wish on me or my team. Anyway, plans are in the works for a temporary replacement and repair. We hope the fire will soon return. Fieldwork can definitely take its toll. I think the average equipment is designed for one or two trips into the woods per year. We put it to the test day in and day out for months. The result - wear, tear, and downright failure. So far this season we have destroyed a GPS unit, ripped holes in otherwise good clothing, and my new boots, just months old, are already coming apart. Off trail hiking in rugged terrain, through brush, over rocks, etc is probably outside the standard design parameters of today's manufacturers. The human body generally gets stronger under strain, but the products that we manufacture just can't hold up. If there was a time to copy plans from nature, now would be it! This last week the South Hills were hit with a big snow storm. At 6 am it started raining. I told the team that it would all be ok. The rain would stop and we would get our tasks for the day completed. I was right, the rain did stop. 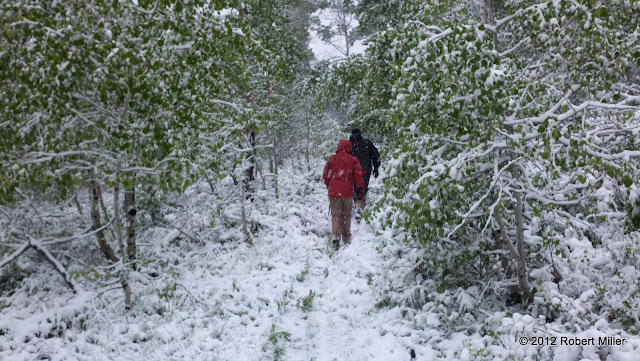 It started snowing... Ok, we canceled the first prey transect, but the second one would surely be ok. It started snowing harder... Plan C: we will hike to check some nests. This we did accomplish. Hard to spend time looking up in these conditions with snowflakes cutting our corneas. The rest of the day was a bust. Late in the afternoon, I determined that prey surveys must also be cancelled for the following day. I really didn't like this. Only one task remained for our week - to check the status of all ten occupied nests. A plan was drawn up - Emmy would take the close nests in the truck, Mike the west-side nests on the remaining ATV. My task included a 60 mile tour on my motorcycle over the most remote roads in the South Hills. My commitment to check off this last remaining task of the week would lead to a collection of questionable decisions, which luckily turned out all right as I am here typing this post. I left the cabin at 7am on a cool morning over snow covered roads. 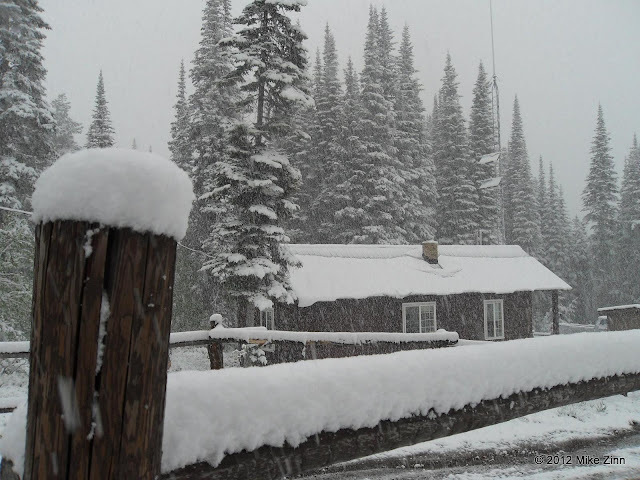 There was six inches of snow piled up on the cabin but only a dusting on the main highway. As I climbed in elevation toward Monument Peak, the snow started getting a little deeper. By a little deeper, I mean a lot deeper. Then there were snow drifts near the ridge. Wow, those were tough to ride through. The motorcycle would spin as I used my legs to help push through. It's worth noting that if I was still riding my Yamaha TW200 from last year, I would have been finished about 2 miles from the cabin, either stuck or headed back home. However, a Suzuki DR650 has so much raw power that it can blow through a lot of snow. This power is a blessing in many situations as the quote "when in doubt, power out" is truly something to live by. In this situation it just enabled me to get deeper into trouble. I should back up and address the title of this article. To be authorized to drive a Boise State vehicle, we were required to watch a 4x4 training video. The main rule of the video is to proceed "as slow as possible but as fast as necessary." This has become the theme of our field work as I instruct the team to approach a goshawk nest to "keep as far away as possible, but as close as necessary" to get the job done, or to causes as "little disturbance as possible, but as much as necessary". It applies well in many situations. In 4x4 work and motorcycle work, it is truly a great thing to remember. I was traveling as slow as possible to avoid a significant slide out event, yet had to maintain a critical minimum speed to bust through the snow mounds confronting me. As I punched through snow drift after snow drift, only 5 miles into the day's task, I somehow convinced myself that once I got past Monument Peak, it would get better.... It did not... Another 15 miles along the ridge equated to another 15 miles of snow drifts to work through. In between the drifts were puddles of water frozen over. On more than one occasion I plunged my foot deep into the water to prevent a more catastrophic and intimate encounter with our planet. Nothing better than a boot full of water in 32 degree weather with 3 hours of riding ahead. But all would be ok, I was planning to take a different route back home. I kept repeating a quote from a recent movie I watched - The Best Exotic Marigold Hotel - "Everything will be all right in the end. So if it is not all right, then it is not yet the end". But what end are we talking about?!? I arrived at the first nest I was supposed to check after about an hour and fifteen minutes of riding. I usually get here in less than half of that. Regardless, the female was brooding her young as she should. Things were looking up. I would simply drop down the east side and avoid most of the snow. I could see the green in the valley, the sun was shining, was it the end? No. I descended the rocky slope to the valley floor to find a whole new challenge - mud and lots of it. The power of the motorcycle was evenly matched by the soul sucking quagmire I had entered. You couldn't even stand on this stuff. Inch by inch I and those fossilized dinosaur molecules in the tank pushed the bike forward. We eventually broke through and headed up the other side. I was exhausted, but surely my progress would improve. I was two hours into a three-hour-tour (hmm, that sounds familiar for some reason...). After 4 days off, next week promises new adventures as we install three nest cameras to monitor the diet of the nestlings. This involves climbing 30-50 feet up a tree while simultaneously being attacked by the adult birds. Believe me, they take their nest defense VERY seriously! We will also continue our prey surveys, call broadcasts, and monitoring the status of nests. I really enjoy both your writing style and perspective. Keep up the great work!